Feast Day is April 29. 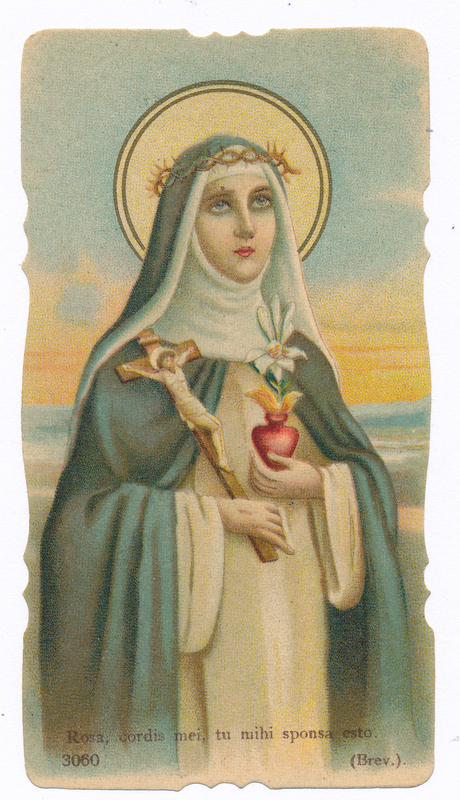 Action and activism are the essence of Saint Catherine of Siena. Passionately devoted to the salvation of mankind, she left an astounding legacy of four hundred written letters and a devotional Dialogue that are considered great classics in literature. She is credited with influencing the return of the papacy to Rome from Avignon, and for this reason she is the patroness of Italy. Known for her incredible charm, she horrified her wealthy parents by her willingness to express her devotion to Christ through corporal humiliations and long periods of fasting. Counselor and advisor to those in power, it was said that she perfected the art of kissing the Pope’s feet while simultaneously twisting his arm. Saint Catherine struggled against great odds to keep the Catholic Church united. Her novena is a call to faith in troubled times. She is invoked to engender the strength and faith for action in times when action is needed, both political and spiritual. Born Caterina Benincasa, the youngest of twenty-five children, Saint Catherine’s father was a wealthy dyer. At the age of six she had a mystical vision of Christ surrounded by saints. A beautiful and cheerful child, she alarmed her parents by spending much of her time in prayer and meditation. She grew devoted to Christ and, like him, wanted to take on the suffering of the entire world, secretly mortifying her flesh and fasting for days. Saint Catherine is the patroness of fire protection because her sister saw her deep in prayer in the kitchen, engulfed in flames from the stove. When she was pulled out, there was no evidence of burn marks on her body. Her parents, wanting a normal daughter, were angry at her refusal to marry or to improve her personal appearance. They finally gave in to her religious cravings and allowed her to become a tertiary (lay person) in the Order of Saint Dominic. She lived at home and went out to work, caring for those with the most repulsive diseases when no one else would help them. For this reason, Saint Catherine is also known as the patron saint of nursing services. Because of her great spiritual insight and radiantly happy outlook, she attracted a following in Siena known as the Caterinati. They did much to revitalize an interest in spirituality in Siena and its surrounding regions. On the Fourth Sunday of Lent in 1375, Saint Catherine received the stigmata; the wounds of Christ appeared on her body and then disappeared, visible only to her. Illiterate, Saint Catherine dictated hundreds of letters and spiritual writings to her secretaries. It was her constant barrage of letters to Pope Gregory XI that influenced him to move the papacy back from Avignon to Rome. She later became the advisor to his successor, the arrogant and difficult Urban VI. When he caused a great schism in the church, the College of Cardinals having voted in a rival Pope to return to Avignon, Saint Catherine remained loyal to Urban. She lectured him in countless letters on how to best improve himself. At his invitation, she moved to Rome to work as a papal adviser. When she died there of a stroke at the age of thirty-three, the wounds of the stigmata reappeared on her body. Heavenly Father, your glory is in your saints. We praise your glory in the life of the admirable Saint Catherine of Siena, virgin and doctor of the church. Her whole life was a noble sacrifice inspired by an ardent love of Jesus, your unblemished lamb. In troubled times she strenuously upheld the rights of his beloved spouse, the church. Father, honor her merits and hear her prayers for each of us. Help us to pass unscathed through the corruption of this world. Help us always to see in the Vicar of Christ an anchor in the storms of life and a beacon of light to the harbor of your love, in this dark night of your times and men’s souls. Grant also to each of us our special petition. We ask this through Jesus, your Son, in the bond of the Holy Spirit. Amen. (Pause to pray for your intentions). This entry was posted in Forgiveness, Grace, Health, Love, Novena, Peace, Prayer, Saints, Situations, The poor by sandra dipasqua. Bookmark the permalink.